HereÊis a photoÊof my bonded aluminum 1991 Miyata 1400A, found on Ebay in 12/05. This 54cm frame features a bonded aluminum fork as well. Standard equipment of the era was the Shimano 105 7-speed SIS gruppo, finished in a subtle green tint. The rims are Wolber hard anodized with semi-aero profile. The paint is purple metallic with the then-cool Miami Vice style neon graphics. 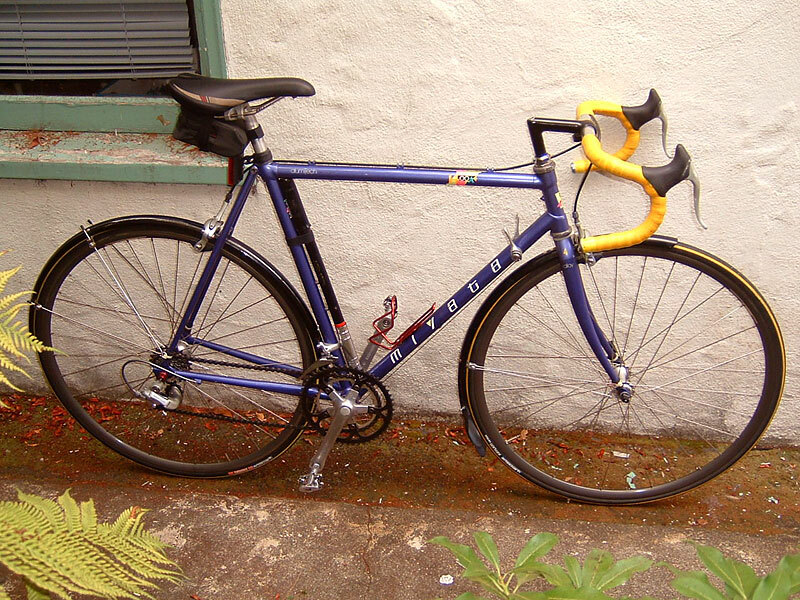 I rode it as my main road bike in 2006, then obtained a Lemond, so this is how it is today, as my winter rain bike. I changed the crankset to a Sugino 52/36 for better hill climbing performance, installed a cushy Bontrager saddle, Weyless SPD pedals, a rear tail light, vintage Silca frame pump, and a set of Michelin Carbon tires for smooth rolling puncture resistance. It's main change to rain bike is the Planet Bike fenders, which were stolen off Current Classic #70. I mounted the fender supports with a wrap of cloth tape around the stays and fork, then used plastic cinch ties to hold tight. The brake bolts hold the upper fender mounting flange. This method is excellent, with no tire rubbing, and enough flexibility to adjust on-the-fly by hand. Fenders are the difference between riding or not riding on a wet, miserable day. Overall, it is a sweet handling bike, light and nimble, a good climber, a delight to ride as it is like a quality steel frame, a shade more muted in road buzz. I could ride this bike "hands off" all day long.